KoopaTV: Enjoy Smash On Wii U — While Ferguson GETS Smashed! 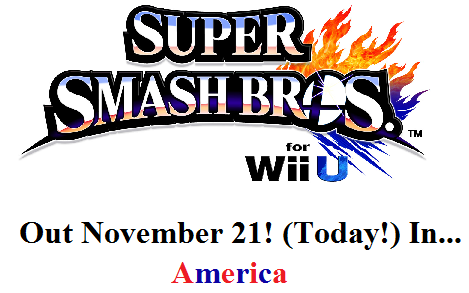 Enjoy Smash On Wii U — While Ferguson GETS Smashed! By LUDWIG VON KOOPA - I'm only writing the article like this because I'm not getting the game on launch day. People would prefer to see THIS image in social media than the one at the end of the article. Oh, Pokémon Omega Ruby/Alpha Sapphire is also out today. I guess some of you care about that for some reason. Just like Pokémon X/Y, you cannot post screenshots in the Omega Ruby/Alpha Sapphire Miiverse community, so... yeah. Have fun not sharing your adventures. Then again, you can always just use text! That's what I did with my copy of Pokémon X when it came out last year. Those of you who are long-time KoopaTV readers should remember the awfully long time it took me to actually get Pokémon X, and, uh, I finally got it for my birthday. As I mentioned last night, the daily doctor visits that the CDC required of us at the beginning of the month are now complete. We believe this also means that KoopaTV staff member Kamek is free of his quarantine! Everything is perking up, right? Besides Obama ruining the country? Unfortunately, not everyone who wants Super Smash Bros. For Wii U today with the financial means to purchase it will be able to get it anytime soon. I'm talking about the poor Nintendo fans who live out in Ferguson, Missouri. (We are, of course, assuming there are any.) There are no GameStop stores in Ferguson. There are no Best Buy stores in Ferguson. There are no Target stores in Ferguson. Hell, there isn't even a Wal-Mart. You can verify that yourself by using those store locators! They're all in St. Louis or farther. And if there were any to begin with, they would probably have been burned down by now. Ferguson is pretty much under lockdown right now. The National Guard has been called in there in anticipation of a riot in anticipation that Darren Wilson, the cop who shot Mike Brown, will not be indicted for murder. The government has absolutely no faith in the people of Ferguson to behave like civilised people instead of feral animals, and that lack of faith is probably a good idea based on what happened before. It doesn't help that the area is littered with professional rioters and trouble-makers. We wrote about this before when we celebrated Trayvon Tyson's Punch-Out!! and its one-year anniversary. (We also said there that it would be the only time we would talk about Ferguson. Woops.) After all, Trayvon Tyson's Punch-Out!! was disturbingly spot-on in its applicability to real life. The only way to get games into Ferguson is pretty much through... digital distribution! Is this why Nintendo implemented pre-loading? To cater to the locked-down Ferguson market?! (Am I allowed to make an additional connection between the demographics of Ferguson and the point that article was making about Nintendo conditioning gamers to be lazy?) Hopefully the people of Ferguson have a stable wireless Internet connection and a credit card with its debt paid off at the end of the month, which I also doubt. ...They also can't go to the store and loot buy an external hard-drive. Ferguson, Missouri instead has a real-life Super Smash Bros. — "brothers" are going to smash everything they can, and take what loot they can. They can "Smash Run" from the police while picking up bags of money and items. The out-of-state professional trouble-makers are obviously having a "Smash Tour" of the town. They are under the "Crazy Orders" of the Reverend Al Sharpton. For some, they are doing this "For Fun", but some are out to make a name for themselves "For Glory". If nothing else, Ferguson is on a "City Trial". ...But that's another game. Ludwig will let you know when he gets his copy of Super Smash Bros. For Wii U in the mail, and will certainly take to Miiverse as well. You can Follow him there at NNID PrinceOfKoopas. He also won't be anywhere near Ferguson. Compare this to what we did for Super Smash Bros. For 3DS's launch article. It turns out that Amazon lied to Ludwig about the delivery date.